Do Homes Inside or Outside The Watterson Sell For More and Quicker? Do Homes Inside or Outside The Watterson Sell For More? Our fascination with numbers can lead to some very interesting conversations about the state of Louisville’s real estate market. For instance, this past month, someone in the office asked which area we thought sold better, urban homes inside the Watterson, or the more suburban areas outside of our expressway system. Convinced this was a no-brainer, we piped up with an opinion, but before we had actually dug through the numbers to prove our case. Before you read any further, ask yourself, if we were to look at four “urban” zip codes, and compared them to another set of four that were further east, let’s say “suburban”, which set of sold homes would you expect to get closer to their asking price? As any seasoned Louisville Realtor® will attest, there are two distinct groups of buyers in town – those who will happily live outside the Watterson and those who break into a light sweat when they venture outside the borderlands of I-264. Back to the “urban” vs. “suburban” zip codes. That scenario is exactly what we graphed above. Using 40204, 40205, 40206 and 40207 as the urban set, we compared the ratio of sold prices to listing prices (SP/LP%) of these homes along with a suburban set comprised of zip codes 40222, 40223, 40245 and 40059. Unless you predicted that there would be no pattern at all, we think it would be fair to say that there doesn’t appear to be a relationship at all between where a home is located in relationship to the Watterson and how close to their asking price the eventual sales price is likely to be. The two most extreme numbers, the lowest percentage along with the highest, both come from our suburban set of zip codes, with the urban homes scattered inside those numbers, along with the MLS average. Finally, we took the numbers from the same eight zip codes and plotted out how long, on average, it took homes from each zip code to sell. And look what happens. 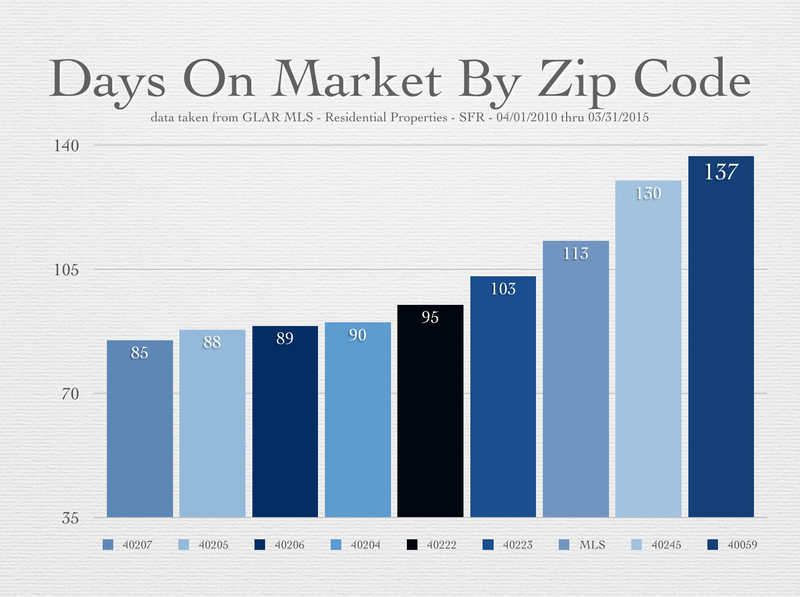 Remember that pretty graph we were looking for earlier, with one set of zip codes clearly outperforming another? Here it is. 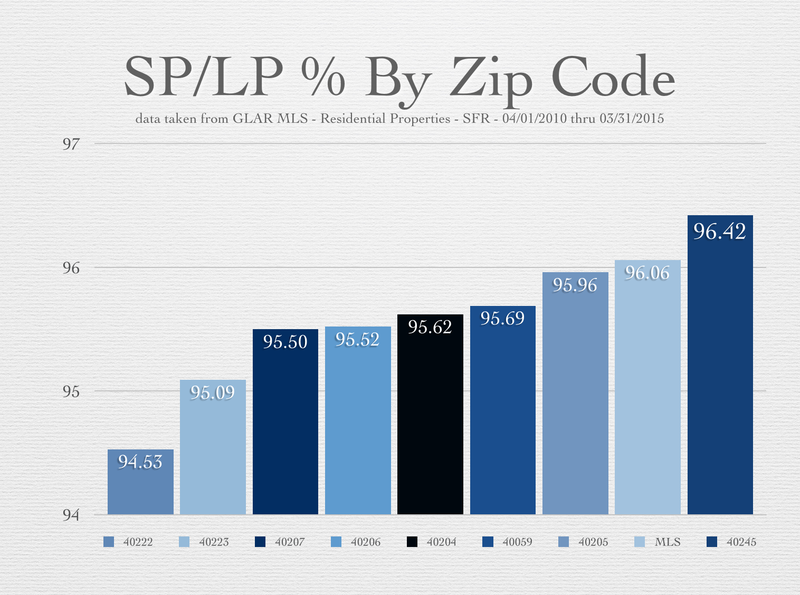 The average price of each zip codes plays into this as there is some connection to how expensive a home is to how long it stays on the market before selling, but that’s for another graph. But for the graph at hand, it is clear that when we look at home sales over the past five years, as a group, the urban homes clearly sold quicker than their more suburban counterparts. Not necessarily for more money, or any closer to their asking price, just less time on the market. This is very interesting. I've often wondered how the location played out in the time on the market and price. Thank you for putting it in easy to read graphs. Very cool.